Hüsker Dü’s “I Apologize”: Power Pop In Disguise | Pop That Goes Crunch! The soundtrack of my summer of 1984 was comprised largely of two double-records that helped stretch the boundaries of “punk rock” and combined cost less than $5,000 to record. They were Double Nickels On The Dime by The Minutemen, and Zen Arcade by Hüsker Dü. All told, these two five-star records packed nearly 70 songs into 143 minutes of sonic wonderment, ranging from punk to funk to jazz to psychedelia to noise to folk to something approaching pop. The two records were relentless and occasionally “in your face.” They were sometimes indulgent. They were sometimes silly. They were “all over the place” in the best way. And they were always brilliant; two of the best of the entire decade. Less than a year later, Hüsker Dü dropped an even better record onto the world — and arguably their best — New Day Rising, clocking in at a mere 40 minutes and change. New Day Rising was direct and focused where Zen Arcade was purposefully sprawling and meandering. Combined with numerous instantly hummable melodies, New Day Rising upped the ante even higher on the band’s overall approach to sonically assaulting the ears and the mind. The best song on the collection is the third track, “I Apologize,” perhaps the single most ferocious piece of Power Pop ever committed to wax. Hüsker Dü, of course, was not the first band to combine a sharp pop melody with the power of punk rock. The Ramones and The Buzzcocks, in particular, did this with great results in the mid and late-70s. The Buzzcocks‘ “Ever Fallen In Love” is a great example of pure pop masquerading as punk rock. I didn’t really get to the Du until “Warehouse”. A spectacular gig in 1987 made me an absolute convert. I saw Bob Mould play on the “Workbook” tour & that was memorable. I did see the Minutemen doc “We Jam Econo” recently & I’m halfway through “Our Band Could Be Your Life” by Michael Azerrad (recommended by a friend) so the US underground of the 80s is finally getting a proper hearing round here. I got to see Husker Du twice, including on the “Warehouse” tour where, I recall, they played the whole thing from start to finish. It was riveting. I lived in LA at the time. The Minutemen were locals, so they played around town a lot. Their shows were pure energy. The news of D. Boon’s death was a punch in the stomach. He WAS the LA scene for a couple of years. 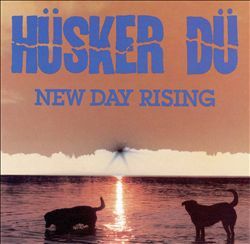 The Husker Du – New Day Rising and Flip tours were two of the greatest shows I had ever seen…or may ever see. The other show I saw was on the Flip tour, at a small club. It was very, very sweaty which, of course, meant that it was awesome.